I am interested in hiking this fall in France and camping along the way. In order to figure what gear I need to pack to camp (particularly for the sleeping bag), I would like to know what temperatures to expect. I am interested in historical temperatures to figure the usual temperature and I might look at them for other seasons. If that matters, I am thinking about hiking in the Pays Basque (South West of France), the mountainous part. Where (ideally online and for free) can I find such data? Are there resources that cover Europe, or even the whole world? I tend to use WeatherSpark to look up historical data. Their main mode is kind of interactive browser (which is fun to play with by itself), but they also generate averages reports for all places their system knows about. It's a little hard to pinpoint accurate location from your description, since Basque Country seems to more eagerly jump to Spain parts in geolocation. Don't forget that while we think of weather data as related to certain area, it's actually gathered in very specific points with weather stations (often airports). I got report for Vitoria-Gasteiz, Spain, while searching for it there. You might want to browse around to refine for something closer to the area you are interested in. 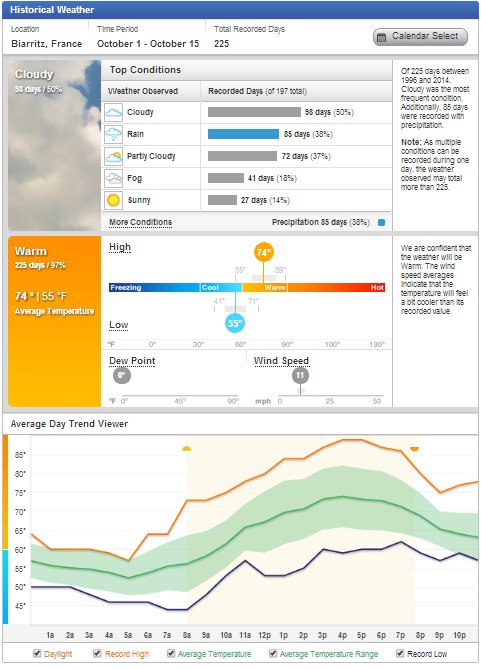 I've always found Wunderground to be pretty useful for travel planning. You can look up the almanac data for any given day. This link has today's data for nearby Biarritz. In addition, their travel planner has the ability to look up the historical weather for a given stretch of time. This link shows an example of the data for Biarritz from October 1 through October 15 (pictured below). Wikipedia's pages for towns, cities and regions often include a "Climate" section which generally includes average and record temperatures, rainfall and so on. Also, I'm sure you know this but remember that the climate at the top of a mountain is likely to be very different than that at the bottom. To add to previous suggestions, you can have some information on the meteofrance (french public service) website. For example, for Hendaye : http://www.meteofrance.com/previsions-meteo-france/hendaye/64700 where you can see at the page bottom average rain, temperatures, and so on. (Rain is something to take into account if you plan to visit Pays Basque). Not the answer you're looking for? Browse other questions tagged online-resources france weather-and-climate camping basque-country or ask your own question. Would it rain in Florida during thanksgiving? How hot in Italy on June? Is there enough snow for activities in October in Tromsø? Weather map for US coasts including past patterns and monthly averages? Is there a website to find someone to travel with? Is there a map showing historical average precipitation at a specific time of year?